Plummeting Planes . . . The number of takeoffs and landings at Griffiss International Airport is down since 2011. Recent figures from the Federal Aviation Administration show a drop-off of more than 30 percent, from 60,265 in 2011 to 40,474 in 2012. That is a nose-dive in flights no matter how you look at it. Our officials are blaming the economy and they are right -- THE LOCAL ECONOMY. Oneida County has been shedding jobs and people from long before the national malaise due to the high cost of doing business here -- and spending another $1.5 million on this facility on top of the tens of millions previously spent before has only worsened the situation. How much money have we lost on our "investment" so far? Griffiss "International" has been a boondoggle of get-rich projects for the connected elite... but the average tax payer has nothing to show for it... less than nothing because a perfectly good airport in Whitestown was destroyed for it. Griffiss International will mire the region in debt and other expenses for years to come. And the sad thing is . . . by applying a little common sense this outcome would have been known from the very beginning. In the first year, the new legislation would award ten $20-million dollar grants throughout our country. "Early childhood education is going to be cut, education for special needs kids, money for our local firefighters, police officers and teachers will all be cut," she said. "So basically, all of our highest priorities for local and state spending will be cut. Finally something to cheer about! Bass Pro Shops headed to the Mohawk Valley and they're coming to the Riverside Center . . . in UTICA! This IS a Big Deal. Ask the folks in Buffalo who have been trying to get one for years. The location is fantastic on the prime route to the central Adirondacks, and reflects the traditional position of Utica as the gateway to ADK adventure. One might imagine shuttles running between Union Station and the Bass Pro store for people wanting to gear up while taking the Adirondack Scenic RR from NY City to Lake Placid once the line starts running there. Congrats to the folks who helped pull this off. The Regional Solution . . . There needs to be a city-wide — and a regional — spirit of cooperation as very difficult choices are made. And suburbanites who think that Utica’s fiscal woes don’t affect them are sorely mistaken. In the end, as the urban center goes, so goes the region. . . .
Metro areas that thrive do so because a collective mindset focuses on the hub and works cooperatively. Utica’s population has dwindled not only because people and business have left; much of what once was in the center city has sprawled into the suburbs.
. . . DiNapoli rightly pointed out that Utica’s suburban communities won’t be as attractive to newcomers if the urban center is weak. This blogger could not agree more with these statements. But then the editorial board misses the mark.
. . . the mayor . . . must continue to reach out to neighboring municipalities to establish inter-municipal agreements that can help cut the cost of government. The editorial board assumes that regional partnerships cut the cost of government. But do they really? How well has regionalization of water and sewer services worked out? Certainly the costs of both services have skyrocketed. While some of the costs are attributable to new state and federal mandates, it cannot be denied that both systems now service more acreage while the population served has dwindled. That means fewer people must pay to maintain more pipes, water and sewage must be transported longer distances, and service vehicles must clock more miles to keep things running. Regionalization, thus, has increased costs -- for everyone. The key to understanding why this happens is population density. Services can be kept affordable when they are confined to densely populated areas. Extending services into less-dense areas increases costs. 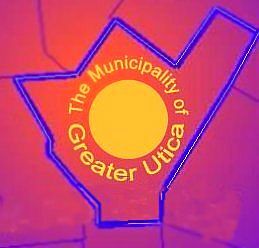 If the past is predictor of the future, Utica's entry into shared-services agreements will only accelerate sprawl and its own demise, taking the region down with it. Though many are reluctant to tear down physical borders between our communities, we must abolish mental ones and embrace a more regional attitude. A "regional attitude" is not enough. As long as Greater Utica remains divided there are financial incentives for the suburbs to sprawl. The region's decline will not reverse until the physical borders actually come down and the people of the region start governing themselves as a region. "Seeing this come to fruition is really a high point of my career," said Frank Kobliski, Executive Director of Centro. "This is what it's all about, making the transit experience the best that you can for the customer and the community at large." . . . Five stops will be eliminated on Genesee Street from the Radisson Hotel down to APAC . . .
Is Anyone Else Uncomfortable With This? The website, LeadsOnline.com, allows law enforcement agencies to "search for suspects and stolen property across secondhand stores, scrap metal dealers, pawnshops and Internet drop-off stores . . ."
But "the website" is NOT "law enforcement" and it is NOT a government agency. It admits so. It is a private entity. "TO THE FULLEST EXTENT PERMISSIBLE BY LAW, LEADS DISCLAIMS ALL REPRESENTATION OR WARRANTIES OF ANY KIND WHATSOEVER INCLUDING FOR ANY BREACH OF SECURITY ASSOCIATED WITH THE TRANSMISSION OF SENSITIVE INFORMATION TO LEADS OR THROUGH THE WEBSITE." While there is no reason to believe that the website isn't run by a reputable company with a great product -- and the people running the operation certainly look like nice people -- shouldn't the choice be YOURS who has access to your private transaction information? -- or at least the choice be of the person you choose to do business with? With the collection of such information into one place, isn't there a potential for abuse? If you are in financial distress and visit pawn shops regularly, do you want that information out there? Should the County be choosing who has access to your private information? While the database may make the police's job easier, this forced-sharing of information with a 3rd party over whom no one has control is troubling.